Bike Commute Diaries: Wide Load Ahead | One woman. Many bicycles. 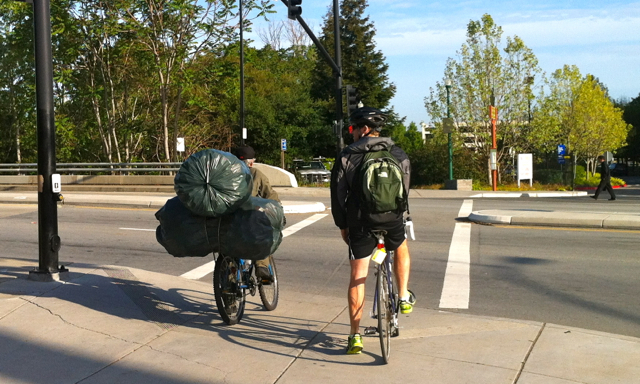 No matter how pleased you are by how much stuff you’ve loaded on your bike, there’s always someone who’s carrying more. This man’s bike means business. Yeah, wow. I think they’re recyclable plastic bottles and aluminum cans, so they probably aren’t heavy. wow! Sometimes I have to care a lot of things on my way to work too, but usually I drive my car all the way down to the place that I have to leave my stuff, with my folding bike inside the trunk and after that I just ride my bike to work as always!